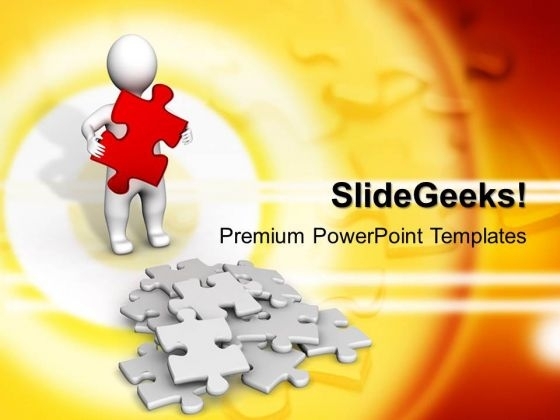 3D Man Carry A Red Puzzle Business PowerPoint Templates And PowerPoint Themes 1012-Create visually stunning Microsoft office PPT Presentations with our above template consists of 3d small person holding over red brilliant jigsaw puzzle piece. This image represents the concept of business stratgey. It is a useful captivating tool concieved to enable you to define your message in your Business PPT presentations. The structure of our templates allows you to effectively highlight the key issues concerning the growth of your business.-3D Man Carry A Red Puzzle Business PowerPoint Templates And PowerPoint Themes 1012-This PowerPoint template can be used for presentations relating to-"Man with red puzzle piece, success, business, metaphor, people, finance" Arrive at your desired destination. Complete the distance with our 3d Man Carry A Red Puzzle Business PowerPoint Templates And PowerPoint Themes 1012. 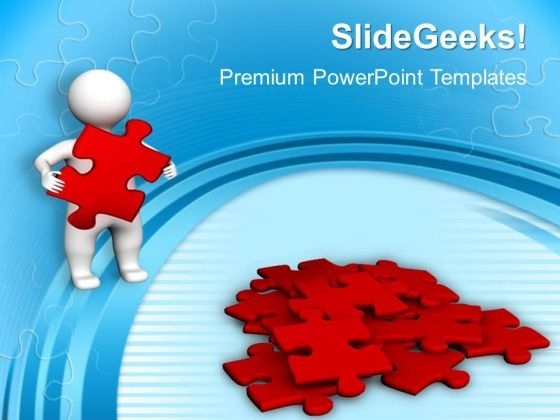 3D Man With Red Puzzles PowerPoint Templates And PowerPoint Themes 1012-Create visually stunning Microsoft office PPT Presentations with our above template consists of 3d small person holding over red jigsaw puzzle piece. This image represents the concept of found a solution and way out. The ideas and plans are on your finger tips. Now imprint them on the minds of your audience via our slides. This template imitates business strategy, opportunities, leadership and teamwork etc.-3D Man With Red Puzzles PowerPoint Templates And PowerPoint Themes 1012-This PowerPoint template can be used for presentations relating to-"Man with red puzzle piece, success, business, metaphor, people, finance" Our 3d Man With Red Puzzles PowerPoint Templates And PowerPoint Themes 1012 are faithful servants. They will put in all possible effort for you. Expose the facts with our 3d Man With Red Puzzles PowerPoint Templates And PowerPoint Themes 1012. Get down to the actuality of it all.